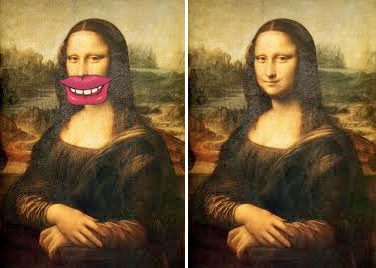 Mona Lisa doesn’t need to shout. With confident, restrained grace, her smile draws us in with more power than a shout. It is as if her smile knows its place within the masterpiece. Designing a masterpiece and designing a marketing strategy share this in common: both require an artful balance of relative context through selective, focused and deliberate strokes. In design, crowding your medium with noisy elements is not a promising way to achieve a memorable, lasting masterpiece. From Mona Lisa’s smile, we learn that brands can be more effective by finding their unique but coherent place within a canvas of competitors. Your competitive position should reflect not just an internal awareness of your brand, but an acute external awareness of your competitive context: how are you perceived and what makes you stand out amongst competitors? And that’s exactly how memorable art comes to be: the artist places the appropriate weight, focus and distinctive value upon the central figures in a piece by building upon the background and supporting elements in a coordinated and delicate matter. Which smile most resembles your brand? 1. What is website engagement? Website engagement is the combination of the quality, quantity, frequency and depth/complexity of user actions/interactions, outcomes & experiences on a website that matter to that website’s owner. 2. How should it be measured? Website engagement is measured by qualitative and quantitative KPIs that track how much (volume/absolute metrics), how efficiently (ratios/rates of engagement/ROI) and how exceptionally (customer satisfaction index, etc.) a website is delivering on its promise to its target audience(s). 3. What specific approach and measurements should be used? From a high level, it involves the whole customer lifecycle, measuring interactions/conversions at different phases in the customer-company relationship, from the point of registration/first use, to first purchase, repeat purchase and other engagements related to long-term retention. From a ground level, I would look at micro-conversions that logically and actually prove to be leading indicators of growth in the area of key business outcomes. I measure engagement on the current website I manage by tracking a closely linked series of metrics. First, I look at registration conversion rates and bounce rates to gauge the quality of the traffic I’m driving to my site. Then I look at the absolute volume of new traffic I’m driving to my site, in order to track the reach/exposure of my organic/unpaid and paid advertising efforts, as well as other marketing channels (email, SMS, RSS, etc.). After that, I turn to site usage data, like entry & exit points, keyword & referring site data, avg. # of page views, common internal searches, etc. Then I look at conversion rates, CPA (cost per acquisition/conversion) & ROI, and the average window of time it takes for a customer to make their first transaction or key conversion. Then I look at overall conversion rate for that first transaction. After that, I evaluate retention related metrics, like % of customers with more than X number of transactions and % of customers with and AOV greater than $XXXX. (This assumes a few things about the given business model in which I am operating, but it is for the most part broadly applicable). Lastly, I would gather survey data and call center data to measure customer satisfaction and gather insights into customer behavior on the website. If you can manage it, talk to customers directly or reach out to them on customer complaint forums or by email. Any channel you can use to extract valuable qualitative data is priceless. Phew! That was a mouthful. Hopefully this helps frame website performance in a holistic light, if nothing else. These questions were raised in a course of mine and I thought they were simple, but pointed. 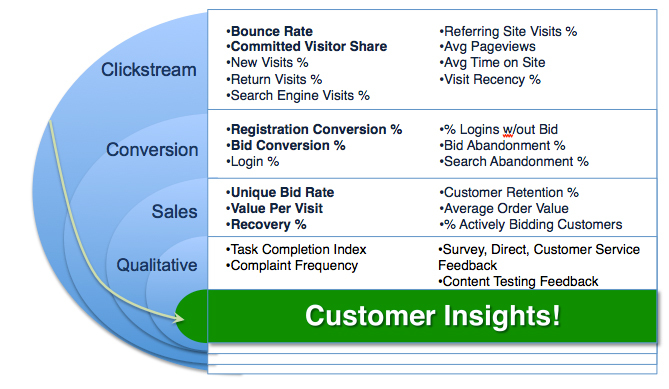 This graph is loosely based on Avinash Kaushik’s model in Web Analytics 2.0.